Tested working great. See photos for everything included. These are super cool and sound fantastic. 0.39" beryllium drivers. These headphones feature protection from splashing water, no matter the direction. IPX4 water-resistant. In-ear proximity sensors. The earphones are in like new condition. Works perfectly. Used Master and Dynamic MW07 Tortoiseshell acetate Earphones. These durable yet lightweight wireless earbuds are handcrafted from eye-catching acetate and stainless steel. The handcrafted quality ensures no two earphones look identical. Enjoy the powerful quality of an on-ear headphone with the ease of a wireless earbud. Master & dynamic mh40 over ear headphones. Condition is New in box never used. Awesome headphones. Bought two pairs so selling of my second. 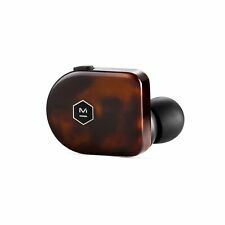 PREMIUM LOOK: These durable yet lightweight wireless earbuds are handcrafted from eye-catching acetate and stainless steel. The handcrafted quality ensures no two earphones look identical. This auction is for a used Master & Dynamic MH30 On-Ear Headphones - Gunmetal/Black with case. They are in decent cosmetic condition with some signs of wear. Included case and audio cable. Returns are accepted within 30 days. Shipping is offered within the contiguous United States. Master & Dynamic MW 50 wireless on/over ear headphones Brand new/factory sealed Black/Olive color Ships same day as cleared payment via USPS w/ tracking number Payment must be made within 24 hours of auctions end, will ship Internationally for additional shipping cost (please wait for invoice if international) any other questions please ask! Original box and accessories as pictured. Item is as displayed in picture. Master and Dynamic MH40 over ear headphones, Black/Black. Condition is Used. Master & Dynamic True Wireless Earphone Matte Black NW07 Sealed. Condition is New. Shipped with USPS First Class Package. Master & Dynamic - ME05 Wired In-Ear Headphones (iOS) - Black NIB FREE SHIP. Condition is New. Shipped with USPS Priority Mail. MASTER & DYNAMIC. PICTURE OF THE ACTUAL ITEM! Premium materials: beautifully handcrafted and eye-catching acetate and durable finish, with a lightweight, slim design. NEW PUT ON ONCE. Master & Dynamic - MW60 Wireless Over-the-Ear Headphones. Listen to music in peace with these Master & Dynamic headphones. The 45mm beryllium high-performance drivers produce rich, high-quality sound, and the omnidirectional dual microphones let you take phone calls and access your virtual assistant. Among the best sounding headphones I've ever heard. Condition Note: Headphones were part of promotion between Master & Dynamic and Genesis Motors. Headphones will have "Genesis" on the ear buds at the bottom. Item is new, open box, box opened only to verify contents. Master Dynamic MH40 Headphone Brown. Model: MH40. This Master & Dynamic Award Winning MH40 Over-Ear, Closed Back Headphones is in great condition. Item Condition: New. The RMA# number that was issued to you should be clearly written on the top of the box and not covered by any labels. Master & Dynamic: MH30 On Ear Headphones - Black / Black -by MASTER & DYNAMIC. Elkridge, MD. Master and Dynamic ME03 Black New. Condition is New. Shipped with Standard Shipping. NEW SEALED! MASTER & DYNAMIC MH40 HEADPHONES GUNMETAL/BLACK! FASTEST SHIPPING! Master & Dynamic MH30S2 Foldable Premium Leather On-Ear Headphones with Superior Sound Quality and Highest Level of Design - Brown Leather. Publisher: MASTER & DYNAMIC. Label: MASTER & DYNAMIC. 2 Year Warranty. Navy/Black headphones, excellent condition. Comes with bag and one aux cable with microphone. Ships same day. Missing headphone pouch and 1.25 Standard 3.5mm cable. Master & Dynamic MH40 Over-the-Ear Headphones (iOS) Black Leather/Gunmetal Wired. Condition is New. Shipped with USPS Priority Mail. NFMI connectivity between earphones. Superior Design: Lightweight, slim body for optimal comfort and fit. Condition Note: Headphones were part of promotion between Master & Dynamic and Genesis Motors. Headphones will have "Genesis" on the ear buds at the bottom. Box shows wear, as pictured. Item is sealed in box. Master & Dynamic ME03 Earbuds. Condition is New. Shipped with USPS First Class Package. Canvas Cord Case. Micro USB Charging Cable. Leather Cable Box. 1.25m Standard Cable. Detachable 1.25m Standard Cable. Canvas Headphone Pouch. In The Box. Bluetooth 4.1 with Aptx™ high quality audio. New ListingMaster & Dynamic ME05 High Performance Headphones - Black - BRAND NEW w/Remote! Condition is New. 8mm Titanium. The remote and mic are supported only by iPhone 3GS or later, iPad, iPod touch (2nd generation or later), iPod classic (120GB, 160GB), and iPod nano (4th generation or later). The harder aspects of these headphones, such as the rotating hinges for folding the headphones whilst storing them, are fashioned of stainless steel. 40mm Beryllium Drivers. However, one shouldn't overlook the sonic aspects of these headphones. Key components, including our lambskin ear pads are designed to be replaceable to ensure decades of use. TECHNICALLY SUPERIOR -Master & Dynamic has a deep passion for creating technically sophisticated sound in our headphones and they look as beautiful as they sound. The remote and mic are supported only by iPhone 3GS or later, iPad, iPod touch (2nd generation or later), iPod classic (120GB, 160GB), and iPod nano (4th generation or later). The remote is supported by iPod shuffle (3rd generation or later).